Fountain View (formerly Fountain View Ice Cream) is Epcot’s home to Starbucks coffee, featuring the same full specialty drink menu of your local Starbucks and pastries and snacks from the La Boulange line. Artisan breakfast sandwiches are available as well, to grab before or after your mad dash to the Soarin’ attraction. 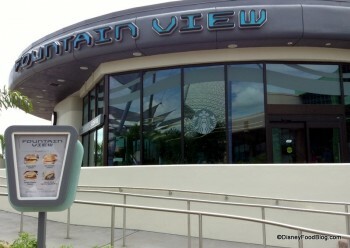 Fountain View’s name reflects the fact that you can watch the famous Dancing Fountains in Epcot’s Future World while sipping your cuppa joe. Similar to the Main Street Bakery (the Starbucks location in Magic Kingdom) baked goods here are primarily Starbucks brand, but there are still Disney cupcakes and brownies in the cases too! Guests will also find warm breakfast sandwiches, and fresh fruit and grab-and-go items available. If you’re craving you’re favorite Starbucks beverage the way you enjoy it at home, Fountain View is the place to find it in Epcot.